Yong Kang Beef Noodle is a restaurant on many Taipei must-eats lists, for beef noodle soup as the restaurant’s name says. So my sister and I went to the restaurant to check it out. The diners were mostly tourists from Mainland China, Hong Kong, and Singapore. We ordered two small spicy beef and tendon noodle soup (hong shao niu rou jing mian), for NT$220. There was a big metal container on each table, full of suan cai (pickled Chinese cabbage). I scooped a big amount of suan cai onto my bowl! There were a few other sauces on the table as well; I can’t remember what they were. The beef was really tender and the tendon was soft! The noodles were soft and chewy. The soup was delicious on the first few bites but then we had become somewhat tired of it. The soup wasn’t that tasty nor memorable, but it was just ok.
My sister didn’t think the food was that spectacular, especially since there weren’t any locals at Yong Kang Beef Noodle. But it was a good experience. Eating there made her realize that much of the food that Taiwan is supposedly famous for is very basic. It’s likely famous for being basic. Good, not spectacular, but decent flavor from few ingredients. Cooking with methods and ingredients that are traditional, tried and true. If you’ve got a favorite beef noodle soup shop in Taipei, please share with us in the comments section below! Beef noodle soup is a Chinese and Taiwanese noodle soup made of stewed or red braised beef, beef broth, vegetables and Chinese noodles. It exists in various forms throughout East Asia and Southeast Asia. Stewed beef noodle soup was first created by the Hui people (a Chinese Muslim ethnic group) during the Tang Dynasty of China. Braised beef noodles was reputedly invented by KMT’s Sichuan Province recruits who fled from mainland China to Kaoshiung, Taiwan, during the Chinese civil war. 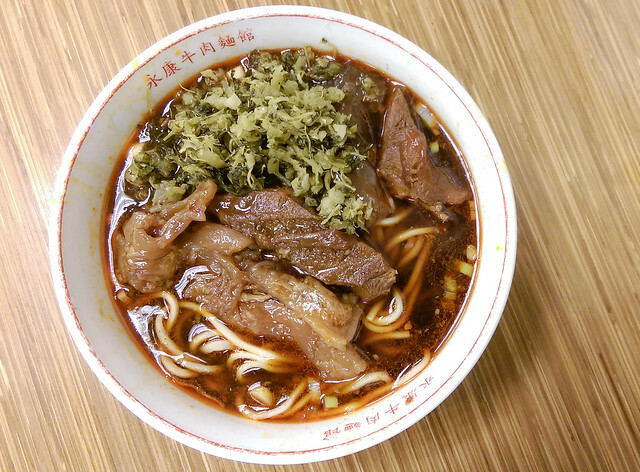 Therefore, it is sometimes (misleadingly) referred to as “Szechuan Beef Noodle Soup” (四川牛肉麵). In Taiwan, it is considered a national dish and every year the city of Taipei holds an annual Beef Noodle Festival, where various chefs and restaurants compete to for the “best beef noodle” title in Taiwan.